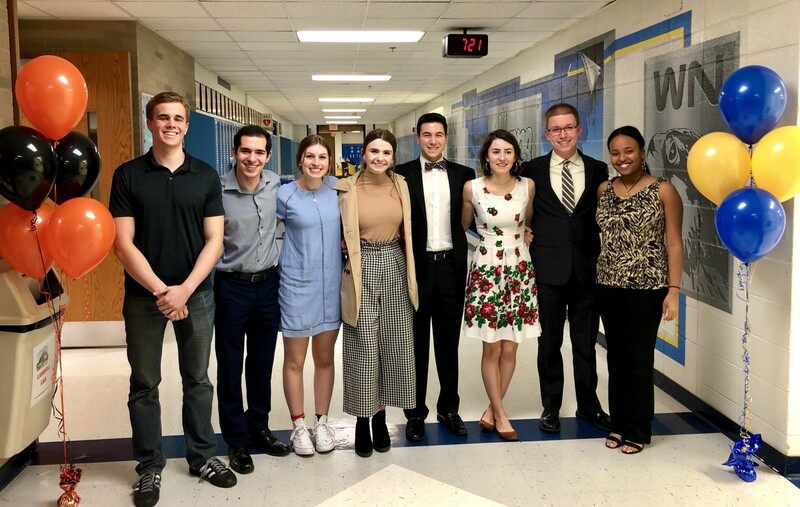 Of the 15,000 students in the country who received the top academic recognition of National Merit Finalist, eight are students at Wheaton North & Wheaton Warrenville South High Schools. The nationwide pool of Finalists, representing less than one percent of U.S. high school seniors, includes the highest scoring entrants in each state. Our finalists and their parents were recognized at the March 13 Board of Education Meeting. Congratulations to our National Merit Finalists — Hania Dziurdzik (North) Connell Hecht (South), Daniel Hjellming (South), Luke Mondia (North), Steven Parch (South), William Richards (North), David Taullabu (South) and Scott Taylor (North). North senior Margaret Allen received the President’s Volunteer Service Award from the Prudential Spirit of Community Awards. This award recognizes Americans of all ages who have volunteered significant time to serve their communities and country. Ms. Allen has volunteered at Central DuPage Hospital, tutored math at school, taught religious education at her church and has been a leader within Link Crew, North’s program to help freshmen adjust to high school. She is also the president of English Honor Society and Social Studies Honor Society (Rho Kappa), which both coordinate a multitude of volunteer opportunities for students throughout the year. Eva Bein is the 2019 IHSA State Champion in Radio Speaking. Eva demonstrated skills of communication with tone, story selection, and articulation on a consistent and superior level. The points Eva scored in Radio Speaking, combined with the other 6 events making the State Finals, helped the Wheaton Warrenville South Team place 2nd in State. This is Wheaton Warrenville South’s 6th consecutive year placing in the top two teams in the IHSA State Competition. The Head Coach of the Wheaton Warrenville South Speech Team is Dave DeMarzo and Eva’s event coach was Brigette DeMarzo. At every assembly, I do indeed scream at Mr. Biscan, but we all do and he asks for it. He screams “WE ARE” and we scream “FALCONS”, “WE ARE” “PROUD”, “WE ARE” “NORTH.” This short phrase we recite back and forth and wear on the back of our t-shirts made me think: Who are falcons? Why are we proud? What is North?…. We are learning to forge ahead of our differences and show off our unique qualities…. We are also proud because we are having uncomfortable conversations that will progress our school in a positive direction. We are learning to be comfortable with discomfort…. Finally, We are north. As I mentioned before, we are all from different backgrounds and going through different adversities, but WE, meaning together, represent Wheaton North.